At Spectra, Particle’s annual conference, they announced three new products designed to improve enterprise-level IoT development. They are bringing IoT to maturity with total development, deployment, and maintenance platform that goes all through to the enterprise level by design. The 3 new products include: The Particle IoT Rules Engine, Particle Workbench, and Particle Mesh SoMs. 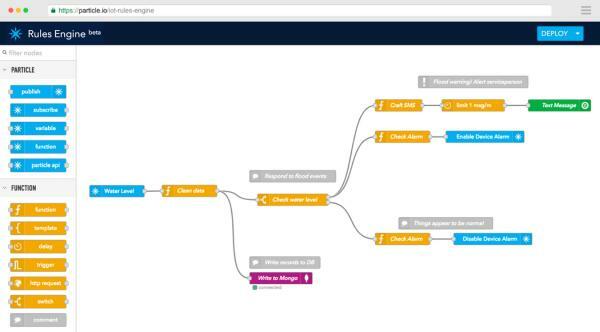 The Particle IoT Rules Engine is a visual drag-and-drop IoT application builder, built on Node-RED open-source platform. You don’t have to spend hours writing a simple IoT application, you can just use the IoT Rules Engine to drop a few blocks into place, and be done in a couple of minutes. It makes it easier for any IoT product developer to create app logic – and get their product to market faster. This is possible through using if-this-then-that style logic – enabling customers to create business rules in the cloud that react to events in the physical world. The difficult aspect of IoT application development is in the essential details, like reading and processing sensor data or integrating third-party APIs. But the building blocks take care of those details, also coupled with the fact that IoT Rules Engine is built on IBM’s Node-RED tool, thousands of logic snippets developed by the community are available for use. 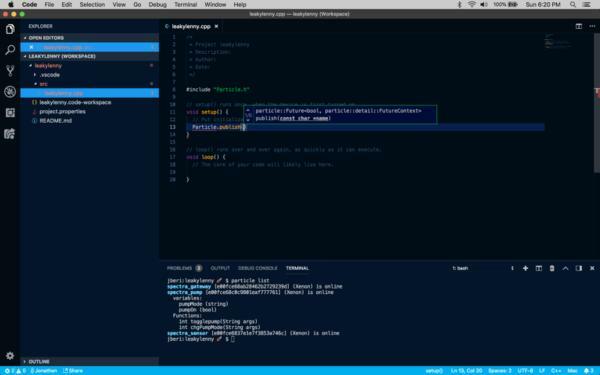 Particle Workbench is powered by Microsoft Visual Studio Code that runs on Windows, macOS, and Linux. It is a cross-platform desktop development environment which creates a robust desktop experience to build and debug professional-grade apps optimized for Particle developers. Particle Workbench gives access to over 3,000 official libraries, plus another 8,000+ extensions in the Visual Studio Marketplace. It has an intelligent autocomplete feature through Intellisense and local compilation. No need to code in one editor and then deploy the code in a separate interface anymore, you can do it all from Particle Workbench. Particle is releasing two new mesh SoMs, the A Series and the B Series. The A Series is identical to the Particle Mesh Argon development board, and has onboard Wi-Fi and mesh networking. The B Series is like the Particle Mesh Boron, and includes built-in LTE and mesh networking. Both modules share the characteristics of their older models, but don’t have large breakout board and pins.